MANCHACA, Texas — When California rings in the new year with the sale of recreational pot for the first time, Texas will be tiptoeing into its own marijuana milestone: a medical cannabis program so restrictive that doubts swirl over who will even use it. Texas is similar to more than a dozen states that restrict access to a low-THC cannabis oil. However, Texas — which is 800 miles (1,300 kilometers) wide — licensed just three dispensaries, none of which are in the western half of the state or in fast-growing cities along the border with Mexico. And the Republican who won over skeptical conservatives to pass her law in 2015 is noncommittal about expanding the program. 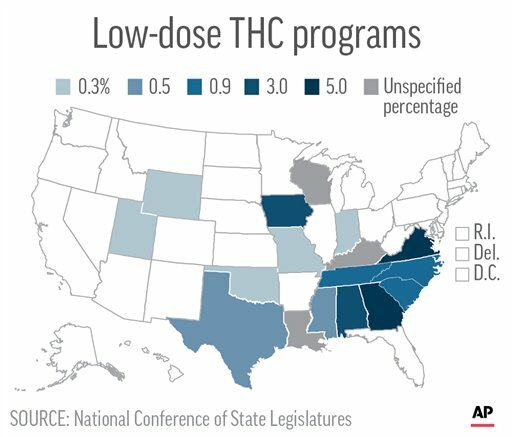 Kristen Hanson, a program director for NCSL, said Texas is unusual for requiring that a doctor “prescribe” the cannabis oil instead of using the word “referral” like most states. The distinction is blamed for dissuading more Texas doctors from signing up, because under federal law, marijuana is classified as a Schedule I drug with no medical use and therefore can’t be prescribed.